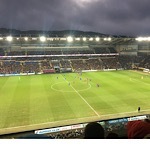 Cardiff City Football Forum | Cardiff City FC Messageboard • View topic - Kenneth Zohore Celebrates by saying "I'm Back"
Kenneth Zohore Celebrates by saying "I'm Back"
If you watch his celebration when he stares at the cardiff fans, you can see his lips mouth the words "I'm Back"
Re: Kenneth Zohore Celebrates by saying "I'm Back"
No doubt its a relief to get it, haven't seen it but I'm told it's a scruffy goal but probably just what he needed. I really hope he stays fit and builds on it. 2blue2handle wrote: No doubt its a relief to get it, haven't seen it but I'm told it's a scruffy goal but probably just what he needed. I really hope he stays fit and builds on it. I have criticised big Ken, but would be delighted to see him do the business. Great finish yesterday. Well done Ken. Savigma wrote: If you watch his celebration when he stares at the cardiff fans, you can see his lips mouth the words "I'm Back"
He’ll be gone again in a few weeks. Well done Zohore, great finish, right in the corner the only place he could have scored, glad to have you back !! Maybe he's been carrying an injury that's been affecting him more than we realise. Anyway, great to have him 'back'.